There is an old adage in hunting that goes something like, “once you pull the trigger, the fun part’s over.” Not for me. While it is true that I am not overly fond of gutting a deer or pig, hauling it out of the bush and later picking off whatever deer lice and ticks have migrated from the animal to me, all through this process my mind whirls. Look at the hams on that deer! Maybe I can cure a roast? How about corned venison? Sausages are a must, but which kind? 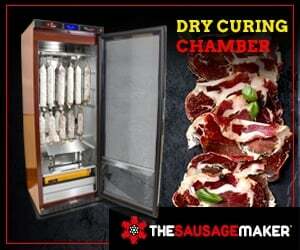 Should I make some salami, too? 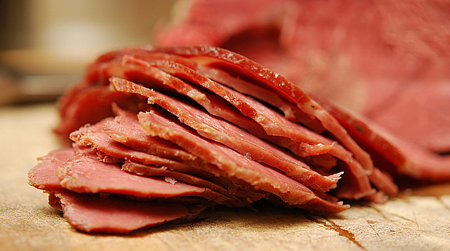 Venison charcuterie is, so to speak, a whole different animal compared with wild boar or domestic pork charcuterie. Here are some things you might want to factor in as you cure various bits of your deer. Fortunately, leanness is no problem when you are curing whole cuts — the effect is not much different from a lonzino, bresaola or any other air-cured, solid piece of meat. Incidentally, while you could surely use my lonzino recipe for venison loin, it should be from a large deer because of shrinkage. You can cure a whole venison ham, but it will be like Italian mocetta, an alpine style of skinless ham done normally with chamois goats. I have a recipe for mocetta here. I also have cured whole-muscle roasts. You pack the meat tightly with spices and curing salt and let it sit in the fridge for a while — how long depends on the thickness of the meat, but it can be upwards of 14 days. You drain off any liquid that comes out of the venison and repack the meat with new spices halfway through the cure. 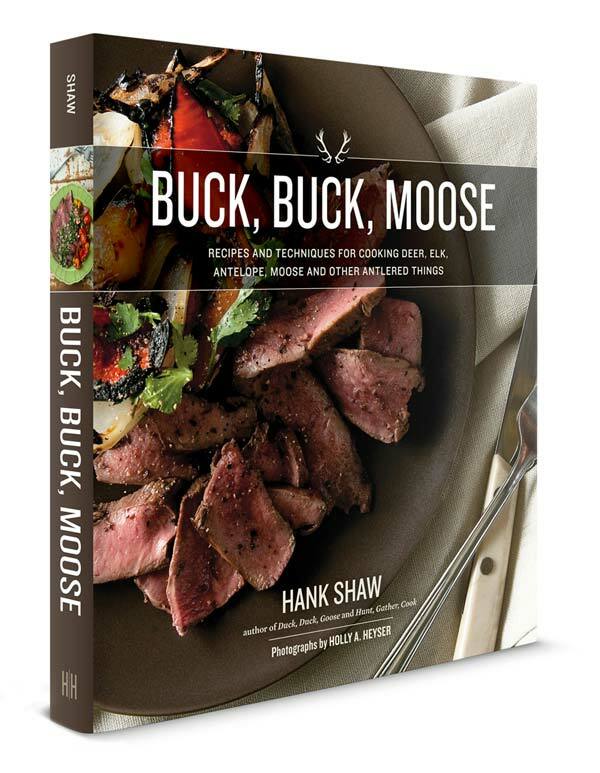 You then truss the venison with kitchen twine and hang it in a cool, humid place for several weeks, or even months. The ideal temperature is about 55°F, and you want the humidity to start about 85 percent, and gradually get drier as the meat ages until you settle on somewhere about 60 percent. I do this by hanging my meat in an old fridge with a temperature regulator attached, and a small personal humidifier set inside the fridge. The result of this cure is essentially a French noix de jambon, the “nut of the ham.” It is delicious — and is best cured simply, with only a few herbs or spices to bring out the venison flavor. Sage, black pepper, maybe some juniper. Another option for large, whole pieces of venison is to corn them. I am very happy with my corned venison recipe, and you can roll the cured roast in a mix of juniper, black pepper and coriander seeds, smoke it and then you’ll have pastrami. I love, love, love a corned venison sandwich, with some mustard or mayo (remember venison is lean, so you need some fat), a few sorrel leaves for tartness, and maybe a few slices of Swiss cheese. Corned venison hash is pretty damn good, too. Jerky is another option, and I am especially fond of my chipotle venison jerky. Venison’s leanness can be a problem when you decide to make sausages. If you have a fat deer, you can use its fat to grind with sausages, but that fat is different from pork fat — it can coat you mouth if you use too much. A good rule of thumb is to include no more than 50 percent deer fat with your sausage grind: In my case 1/2 pound deer fat, 1/2 pound pork fat for a 5-pound batch of sausages. So for the most part you need to add either pork fat or beef fat to a venison sausage or salami. I vastly prefer pork fat, and here’s why: It’s softer than beef fat and far more neutral-tasting. Add beef fat to a venison sausage and it tastes like beef. Add pork fat to a venison sausage and it tastes like venison. Good pork fat can be had in any decent supermarket and in all butcher shops. It’s usually really cheap, too. Your first choice should be back fat, which is easier to cut and slightly harder than the fat in the shoulder, which is the next best thing. Pork bellies are OK, but there is enough meat in them to influence the flavor of your sausage — not necessarily a bad thing, but you should be aware of it before you toss some bellies into the grinder. 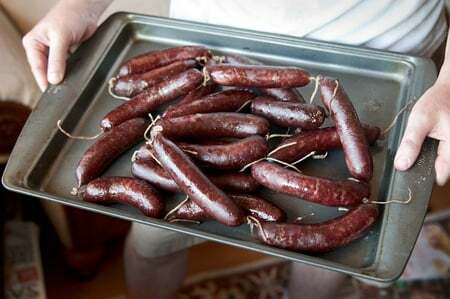 Fresh venison sausages are a joy to eat, and to make. 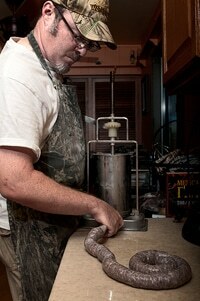 I have a whole selection of venison sausage recipes on this site, and I try to design a new one for each deer I shoot. Sausage is traditionally made with the random trim and wobbly bits of an animal. The idea of grinding up a nice roast or, God forbid, the backstrap of an animal would make an old-school butcher vomit. And while it is true that sausage-making with these luxury cuts is easier — you have far less silverskin and gristly parts to contend with — if you take your time and remove as much silverskin as you can by hand, you can make excellent sausages with the sketchier pieces from the critter. One important tip when doing this, other than to trim all the silverskin you find, is to double-grind or even triple grind your meat. You will be faced again and again with the choice of either discarding some good chunk of meat that’s loaded with connective tissue, or of putting it through the grinder anyway. Put it through the grinder. Start with the coarsest setting, like 10 mm or even a 12 mm, which is really wide. Then go with something like 7 mm or 6 mm, and then, if you want, the fine 4.5 mm or even 3 mm die. 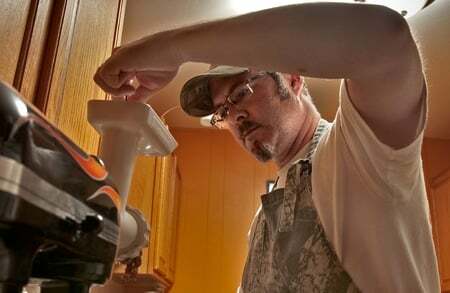 Silverskin will gunk up your grinder if you go right to the narrow die, sometimes quickly. You’ll know this is happening when the meat and fat that comes out of the grinder begins to smear together instead of coming out looking like meaty spaghetti. Just make sure your venison is really, really cold when you do this. Ideal temperature is just above freezing, about 34°F or thereabouts. Put the meat and fat in the freezer for an hour or so between grindings to be sure. This helps prevent smear, where the fat breaks down and coats the meat. If this happens you will never get a good bind on the sausage, and it’ll be crumbly, like bad cat food. While you mix the meat, you still want to see individual little pieces of fat, like the marshmallows in Lucky Charms cereal. 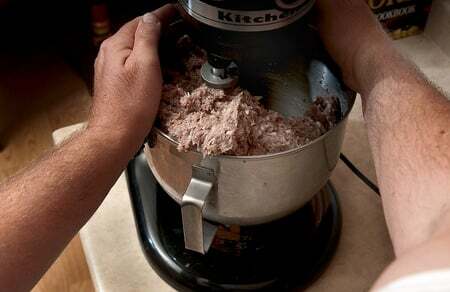 I often mix by hand now, and I know by feel when the mix has bound: Your achingly numb hands will feel the mass as one thing, rather than lots of bits of meat. You can pick up an entire 5-pound batch and it will hang together. Use hog or beef casings to make your sausages; I don’t like synthetic casings. You can get hog casings at any butcher, some large supermarkets can get them for you, or you can buy hog casings online. 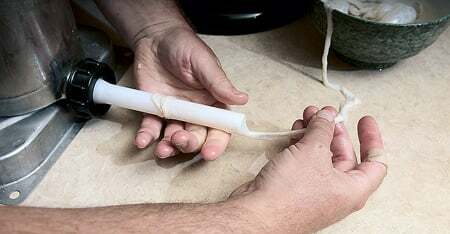 Thread the casings on your sausage stuffer (I use this vertical sausage stuffer, which can handle a 5-pound batch all at once) — and yes, I know. It looks like putting on a condom. Let the hilarity ensue. Then make all your sausage at once. Don’t try to make links until you have it all done. After you have big coils, then link them. 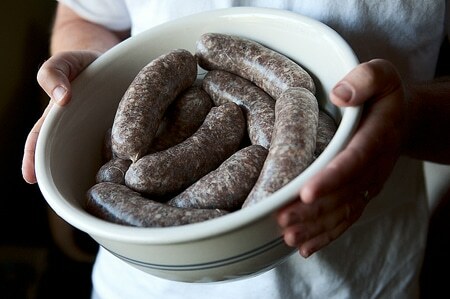 For fresh sausages, I just pinch off 6- to 8-inch links with my fingers, then roll them in opposite ways. I roll the first link away from me, the next link toward me. That helps the links stay in their shape while you dry them. 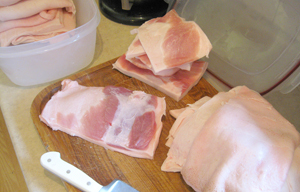 Drying links helps them tighten up in the skins, which improves the texture. I use a wooden clothes rack for to hang my sausages, and it works like a charm. Hang your links a couple hours at room temperature and then let them sit overnight, uncovered, in the fridge, surrounded by paper towels to soak up any stray moisture. Can you eat them the first day? You bet, but the the texture and flavor will improve the second day. All of this work applies equally to salami, which are just dry-cured sausages. You do need to use a different curing salt, in this case Instacure No. 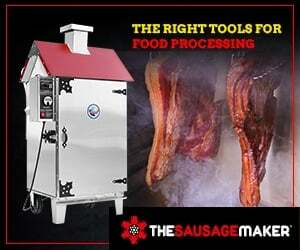 2, and it is best to get a bacterial starter culture from a place like the Sausage Maker or Butcher & Packer. Why? You need these good bugs to properly ferment the salami — and yes, salami is a fermented meat product. That’s why it’s tangy; it’s the lactic acid your tasting. One good option is to make a German landjaeger. It’s a narrow, dry-cured salami with lots of tangy flavor that is small enough to keep in your pocket on a hike… or in our case, in the duck blind. Landjaeger is a little tricky to make. You need to get the ferment going at room temperature for two days, then you smoke the meat as cool as possible — you don’t want to actually cook it if you can help it — and only then does it go into the drying box, i.e., my old fridge with the humidifier in it. This batch looks grand, a beautiful rosy color. You’ll notice I tied off these links with string. That’s because they need to stay that way through long curing, and I don’t want them to come unraveled. The landjaeger dries for at least 14 days, and up to six weeks. I can’t wait to bite into one.